On the corner of Waite Davies Road is an impressive early Edwardian church that Running Past has ‘visited’ before in relation to the naming of the street after its long time pastor, James Waite Davies, and the Butterfield Dairy of the Clarks a little further down the street. It probably ought to be listed, at least ‘locally’, but like many ‘deserving’ non-conformist churches and chapels, it isn’t. ‘Tin tabernacles’ were common in areas that expanded rapidly during the second half of the 19th century – often in northern industrial towns and were linked to the parallel rise of non-conformism. The Bromley Road Tabernacle as it was initially known, due to the former name of Baring Road, has many similarities with its northern counterparts; the small community of South Lee, much of it built by John Pound and sometimes referred to as ‘Pound’s Estate’ had sprung up just to the south of Burnt Ash Farm in the early 1870s. 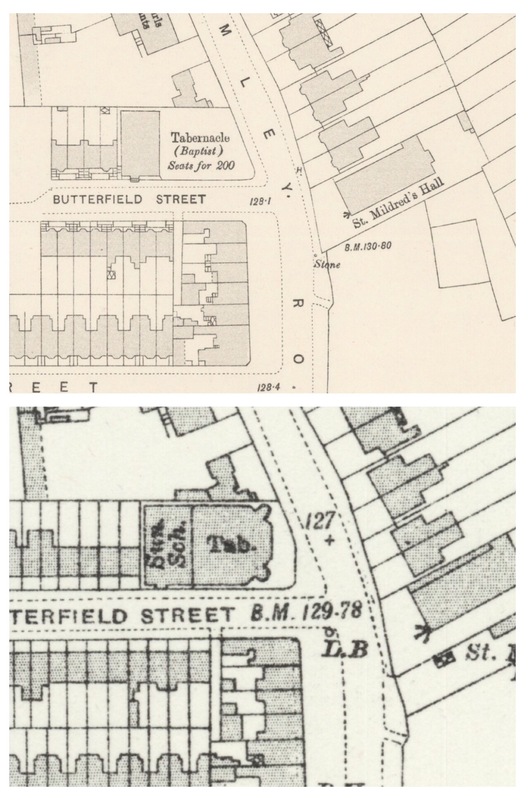 The drinking and local shopping needs were provided for by Pound when he built the area – a mixture of middle class housing and smaller homes for workers in his brick fields and building works. The spiritual needs though had not been catered for. Permission for ‘temporary iron church’ granted in July 1875, so presumably it was erected fairly soon after that (1). The ‘tin tabernacles’ were relatively expensive to build, the early ones cost up to £4 per seat plus land and foundations. 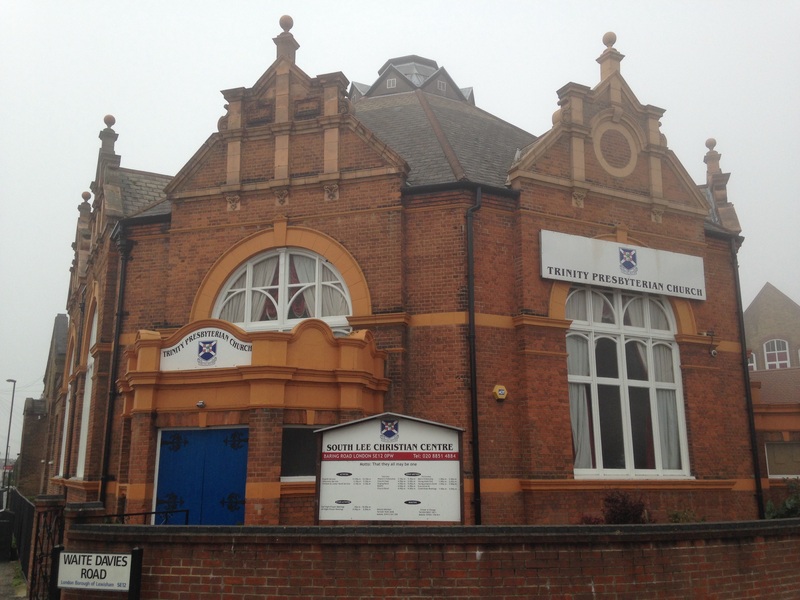 So even relatively small ones, such as the 200 seat one in Lee, could cost £1000 – no mean feat for working class congregations in areas like that around Summerfield Street. It is unclear whether John Pound had any involvement in the building of the tabernacle, if he did it would have probably been as a business rather than spiritual proposition. While he seems to have been responsible for building the Unite Reform Church on Burnt Ash Road, he is known to have helped fund the building of St Augustine’s in Grove Park, a church he lived almost opposite in the 1870s. Lee’s temporary iron church didn’t feature much in the local press and the only on-line reference is to some ornate stained glass windows above the main entrance. 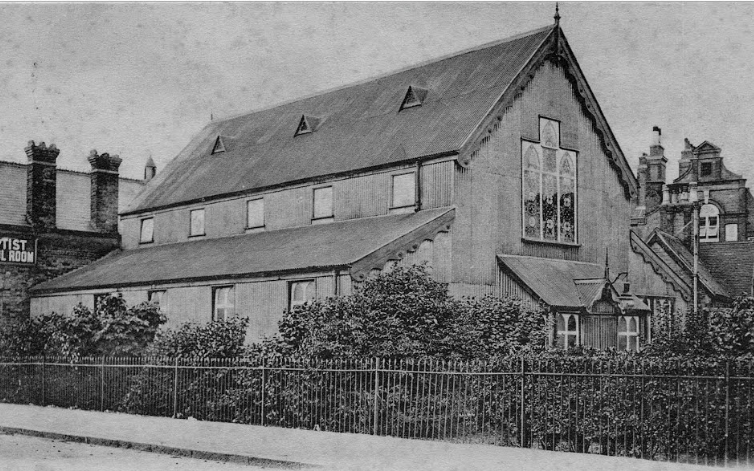 There were at least a couple of other ‘tin tabernacles’ around Lee and Hither Green – a short-lived building used by the Hither Green Baptist Church which lasted for 7 years between 1896 and 1903 before being replaced by the permanent building in Theodore Road (2). 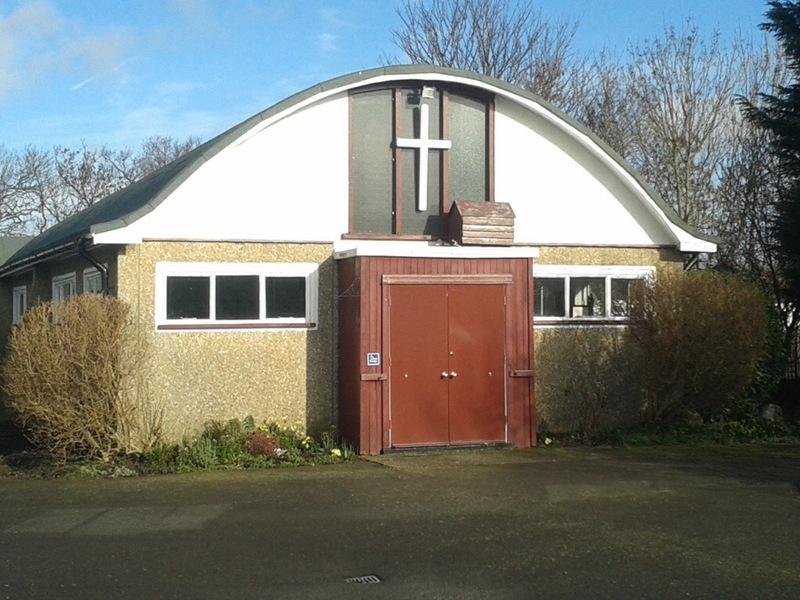 Similarly, the Brownhill Road Baptist Church had a tin tabernacle lasting from 1900 to 1925 (3). Lee’s ‘tin tabernacle’ was to last until the early 20th century – was still there in 1893 Ordnance Survey visited, but had gone by the time they returned in 1914 (4). It is unclear how important James Waite Davies was in the building of a permanent home for his congregation – but certainly his arrival in 1905, may have been pivotal. The tin tabernacles have not been the only temporary church building that Lewisham has seen – around a 1000 metres away, as the crow flies, is the church of St Mark which is part of the Excalibur Estate (below. This entry was posted in Lewisham History and tagged Bromley Road Tabernacle, iron church, James Waite Davies, John Pound, Summerfield Street, tin tabernacle, Waite Davies Road on February 21, 2018 by Paul B.